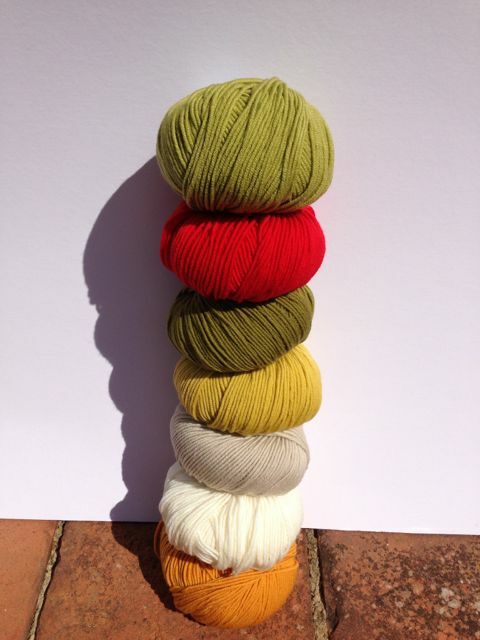 You know that feeling when you have finished a project – happy that it has turned out well and sad in some ways because you’ve finished it – but then there’s this moment when lots of ideas start to crowd into your head – what will the next project be, what colours, what type of yarn – ooohhh the possibilities are endless! It’s that moment of delicious anticipation that I could experience all day long! In some ways for me it’s about the hunting out of the pattern, seeing if it is exactly what you want, or whether you can alter it in some way to suit your purpose, choosing the yarn, the stitches you are going to use and all those bits before you even get close to your foundation chain! All a bit extravagent but I hope it will keep me warm. I’ve found a brilliant pattern from a blog I follow, Moogly, and the pattern is called Leaping Stripes and Blocks which I hope will merge all the colours in really well so they look like leaves on an Autumn tree! So I’ve got the yarn, I ‘ve got the stitch pattern I am going to use, now I need to find a pattern to follow, or bits of patterns that I can cobble together to make a shawl. Watch this space for progress! Are you anticipating something of a hooky (or not) nature!